American bald eagle (315-543) was brought to CROW the first time on March 17, 2015 after being found on railroad tracks in North Fort Myers suffering from a broken clavicle on his left wing. 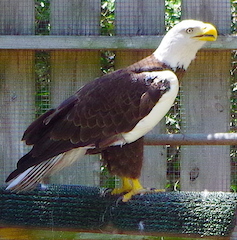 After 3 months of recovery and rehabilitation, Ozzie was released on June 17, 2015 at the Southwest Florida Eagle Cam. Ozzie was brought to CROW a second time on September 27, 2015 after he was found weak and injured in a North Fort Myers backyard most likely from a fight with another bald eagle. He arrived in critical condition, unable to stand and fighting a bacterial blood infection. Unfortunately, on September 29, 2015 Ozzie passed away as a result of his injuries.